Drawing its numerous examples from Britain and beyond, Archaeological Investigation explores the procedures used in field archaeology travelling over the whole process from discovery to publication. Divided into four parts, it argues for a set of principles in part one, describes work in the field in part two and how to write up in part three. Part four describes the modern world in which all types of archaeologist operate, academic and professional. The central chapter `Projects Galore' takes the reader on a whirlwind tour through different kinds of investigation including in caves, gravel quarries, towns, historic buildings and underwater. Archaeological Investigation intends to be a companion for a newcomer to professional archaeology - from a student introduction (part one), to first practical work (part two) to the first responsibilities for producing reports (part three) and, in part four, to the tasks of project design and heritage curation that provide the meat and drink of the fully fledged professional. The book also proposes new ways of doing things, tried out over the author's thirty years in the field and brought together here for the first time. 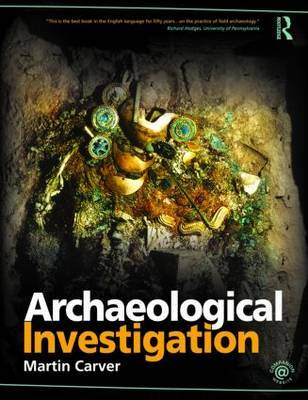 This is no plodding manual but an inspiring, provocative, informative and entertaining book, urging that archaeological investigation is one of the most important things society does.